Wedding in Italy. Wedding photographer in Italy, wedding planner and coordinator of weddings in Italy. Official registration of marriage, a wedding for two in Camogli, Portofino, Liguria. 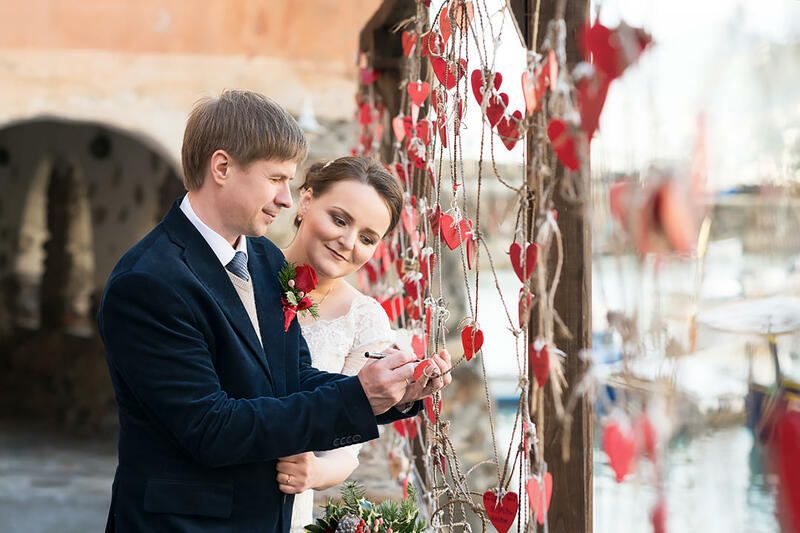 The organization of this wedding was very simple for me, the bride wanted to officially register a marriage in Italy and hold a romantic wedding photo session. As the place for the wedding we chose the town of Camogli, located near to the famous Portofino, and not inferior in its beauty of its world-famous neighbor. After negotiations with the municipity, I booked the date of the wedding, chosen by the bride Irina on December 14, and we started to prepare for the wedding. The weather was wonderful, it was very warm, the sun was shining, but the sea was worried on the eve of the storm (which was after, late at night), so we were lucky to use the sea, which throwed huge waves to the beach, with sunny and almost windless weather. In the morning, arrived a wedding stylist from Genoa and created a wedding image for the bride, and then we went out to the embankment to have a small warm-up photo shoot on the background of the city and the sea before the registration of the marriage.